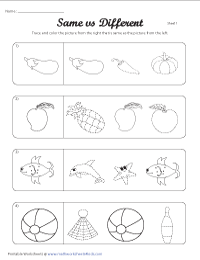 This page contains practice sheets on recognizing same sizes, identifying same objects, differentiating objects, odd one out worksheets and more. 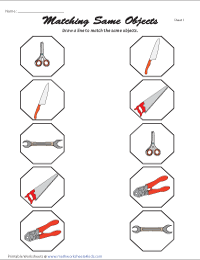 Each worksheet has 5 problems circling picture with the same size. 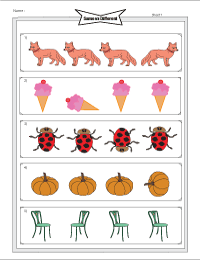 Each practice sheet has unique theme. Color the same size images from the group of 4. 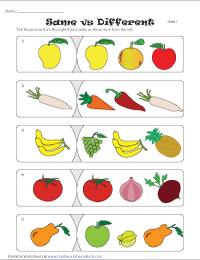 There are 5 such groups in each worksheet. 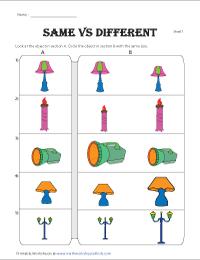 Match each object from the left to the same object from the right. Draw a line to show the matching. There are 3 images from the left. Compare them with the image from the right and tick the one that looks the same. Trace and color the image from the right that looks the same as left. 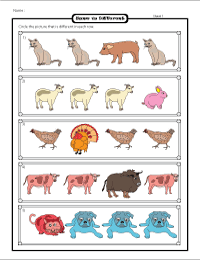 There are four pictures in each row with 3 same images and 1 different image. 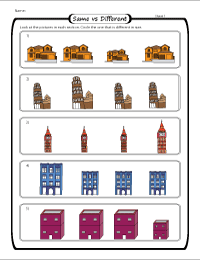 Pick out the different image. 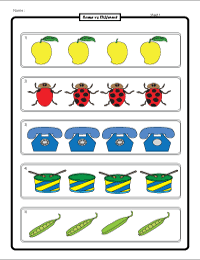 Each worksheet has 5 problems identifying object in different size. 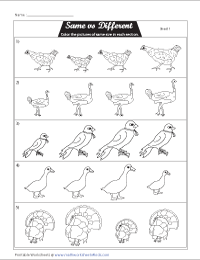 Pick out the image that turns in different direction or position. 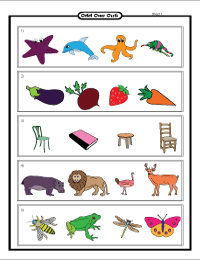 This 'odd one out' worksheets contain 5 problems identifying picture that is different from other 3 images with missing portion or parts. Each group 4 pictures with 3 under same category. Identify the category and pick out the odd one out from the group.